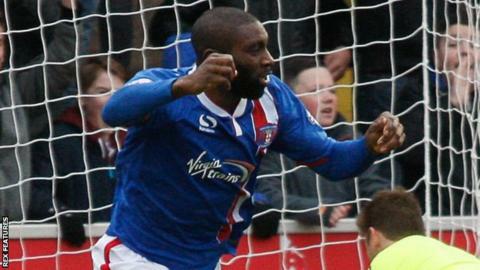 Striker Jabo Ibehre scored his 15th goal of the season to earn League Two promotion hopefuls Carlisle United a narrow win against Stevenage. The Cumbrians are three points off the play-offs after Ibehre headed in Alexander McQueen's lofted cross to break the deadlock in the second half. Boro's Bryon Harrison had been denied early on by goalkeeper Mark Gillespie and Dean Parrett struck the crossbar. Ryan Hedges should have earned them a point, but skewed his shot wide. "I thought for 20 minutes in the second half we seemed to struggle to replicate the good work we did in the the first half. "It was great first half, we came in very happy at half-time. I'm very disappointed at the same point that we haven't taken one of our numerous chances. Every win we attempt is going to be hard-earned and hard-fought. "No one can say my players didn't give their all for the football club today. I was delighted with that, but I know that the list of improvements has got a little bit longer." Match ends, Carlisle United 1, Stevenage 0. Second Half ends, Carlisle United 1, Stevenage 0. Attempt missed. Keith Keane (Stevenage) header from the centre of the box is just a bit too high. Corner, Stevenage. Conceded by Mark Ellis. Corner, Stevenage. Conceded by Michael Raynes. Foul by Adam Marriott (Stevenage). Derek Asamoah (Carlisle United) wins a free kick in the attacking half. Keith Keane (Stevenage) wins a free kick in the attacking half. Substitution, Stevenage. Adam Marriott replaces Ryan Hedges. Substitution, Carlisle United. Derek Asamoah replaces Hallam Hope. Foul by Luke Wilkinson (Stevenage). Jabo Ibehre (Carlisle United) wins a free kick in the defensive half. Substitution, Stevenage. Aaron O'Connor replaces Byron Harrison. Attempt missed. Hallam Hope (Carlisle United) right footed shot from a difficult angle and long range on the left is close, but misses to the right. Attempt saved. Hallam Hope (Carlisle United) right footed shot from outside the box is saved in the centre of the goal. Attempt missed. Luke Wilkinson (Stevenage) header from very close range is close, but misses to the left. Attempt missed. Ryan Hedges (Stevenage) left footed shot from the centre of the box is close, but misses to the right. Corner, Carlisle United. Conceded by Michael Tonge. Luke Wilkinson (Stevenage) is shown the yellow card. Attempt missed. Hallam Hope (Carlisle United) right footed shot from outside the box is close, but misses to the left. Corner, Carlisle United. Conceded by Fraser Franks. Corner, Carlisle United. Conceded by Connor Ogilvie. Goal! Carlisle United 1, Stevenage 0. Jabo Ibehre (Carlisle United) header from very close range to the bottom right corner. Assisted by Alex McQueen. Attempt missed. Hallam Hope (Carlisle United) right footed shot from outside the box is too high. Attempt missed. Jason Kennedy (Carlisle United) right footed shot from outside the box is close, but misses to the right. Charlie Wyke (Carlisle United) wins a free kick in the defensive half. Attempt missed. Dean Parrett (Stevenage) right footed shot from the right side of the box is close, but misses to the right. Attempt missed. Dean Parrett (Stevenage) right footed shot from outside the box is just a bit too high from a direct free kick. Ryan Hedges (Stevenage) wins a free kick in the defensive half. Corner, Carlisle United. Conceded by Keith Keane.